1 Posh have a manager with a real affinity for the club.Wouldn’t you rather want someone who obviously cares in charge of your team? Especially in a relegation dogfight? Ferguson’s commitment cannot be questioned as easily as his current performance. As he said himself last week, he is fighting for his career as well as his job at Posh. 2 Is there anyone out there so obviously better than Ferguson who you would back with any confidence to turn the run of results around? The most obvious internal candidate, Grant McCann, left the club last week. Current coaches Gavin Strachan, Gary Breen and Jimmy Walker have all worked closely with Ferguson this season so they would not be the ‘new’ voice many believe the squad needs. 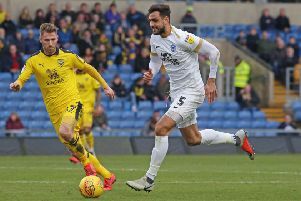 There is a long list of out-of-work managers available, but the likes of Brian McDermott, Neil Warnock and Nigel Adkins would want bigger clubs than Posh. I don’t understand the attraction of Uwe Rosler whose Brentford team choked on their big promotion chance from League One two seasons ago. 3 The manager/chairman relationship is important at any club, but it’s absolutely massive at Posh as Darragh MacAnthony is such a prominent presence. MacAnthony is a demanding, hands-on chairman and there is another strong character in the role of Director of Football at the ABAX Stadium. Some managers would baulk at working under Barry Fry. Would it be worth getting rid of a manager who has the trust of his chairman, and who has become immune to the ways of Fry, and replacing him with an outsider? Would it run the risk of a repeat of the second-half of the 2009-10 season when a handful of managers came and went and relegation inevitably followed? 4 Ferguson’s record at Posh is so strong he demands the chance to survive one bad season. Last season was described as an ‘epic fail’ by the chairman, but it still yielded a play-off place and a Wembley win. The expectations were lower at the start of the season. They are still unlikely to be met, but doesn’t a man with three promotions (no other Posh manager has achieved that) and a Johnstone’s Paint Trophy success (no other Posh manager has achieved that) on his CV deserve the first chance to put things right? 5 Is is fair to lay all the blame at Ferguson’s door anyway? Preparations for the start of this season were destroyed when Britt Assombalonga was sold two days before the League One opener at Rochdale. If Assombalonga was still here Posh may well be sitting pretty in the top six and these articles would not have to be written.